Totally unspoilt, easy cycling off the tourist trail - great for first timers! Our undiscovered corner of Veneto, just 60 minutes (but a world away) from bustling Venice, is the perfect setting for a relaxed cycling holiday. Nestled between the art cities of Padua, home to one of the oldest universities in the whole of Europe, and UNESCO-recognised Vicenza, the region is bursting with Patrician villas - built by Venetian nobles to escape the muggy heat of the city - and ancient castles, although it is surprisingly almost entirely untouched by tourism. Palladio was the most famous Renaissance architect and many of his buildings, including the Villa Rotonda, can be visited on day 7 of this interest-packed itinerary. We take you across the Venetian plain, past cherry orchards and swaying vine terraces, with the outline of the conical shaped Euganean Hills and imposing Colli Berici acting as a constant backdrop. The cycling is wonderfully gentle, over the flatlands of the plain and the low foothills of the Colli Berici, along peaceful canalside paths, cycle tracks and quiet country roads, passing sumptuous villas and historic towns with wine-tasting opportunities on the way. En route the cuisine is fabulous, home cooked fayre and you'll stay with some of the friendliest people we've ever met. In Teolo you'll stay at Tiziana's lovingly restored Liberty villa, whilst there's a warm welcome at Valfrido and Angelina's charming agriturismo near Vicenza, and at the Ottolitri family's hotel just outside Galzignano. Arrive at your friendly agriturismo run by Gabriella and Alessandro, in time for dinner. The day starts along the canalside path to Este. This delightful mediaeval town with its pastel, arcaded buildings boasts a C14 castle and an altar piece by Tiepolo in its Cathedral. Your next stop is Monselice. You can visit its mediaeval castle (converted into a sumptuous residence for a Venetian noble in the C15). From Monselice you follow the canal past the C19 Villa Italia, before arriving at Sig Ottolitri's friendly, family run hotel just outside Galzignano. It's a lovely circular cycle (route notes provided) to Arqua Petrarca, unchanged since the 1370's when Petrarch lived here. Visit his well-preserved house before pedalling off through vineyards to the fabulous Villa Barbarigo at Valsanzibio, the delightfully manicured C17 Italian gardens here are the best in the region. Cycling through swaying vines you reach the charming village of Battaglia where there's time for a spot of wine tasting. 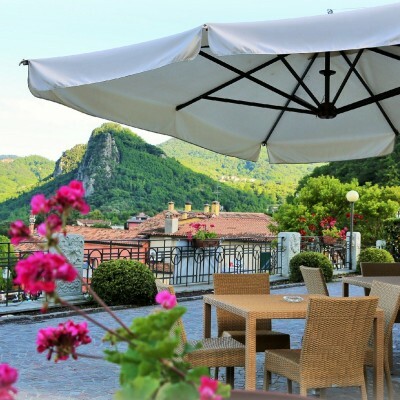 You must try the local Serprino, a medium dry frizzante wine often compared to Prosecco, before carrying on through the spa towns of Montegrotto Terme to the pre-Palladian villa at Luvigliano. After admiring the elegant villa you cycle upwards to Teolo, your hotel is an elegant villa perched high above the town. A former Roman settlement, Teolo's heyday was in the C15 when it became the summer home of Venice's doges escaping the heat on the coast. Many palazzi and formal gardens from the period remain. You could take a walk in the encircling Euganean hills (360 degree views from here) or maybe take the bus into Padua to admire the town's Giotto frescoes. Or, for a longer day out, take the bus/train to Italy's most romantic city, Venice. Enjoy a cappuccino in St Mark's Square, take a gondola under the Bridge of Sighs, admire the opulent gold decor of the Doge's Palace or visit the Peggy Guggenheim Exhibition. The list is endless! Today starts with a 1km climb from the hotel, followed by an exhilarating freewheel down through the Euganean Hills to the mediaeval castle at San Martino. Then, cycling by the Bacchiglione River you reach Cervarese Santa Croce in time for a relaxed lunch in the square. Onwards, it's into wine country once more to reach your charming farm hotel at Villaganzerla where you'll receive a warm welcome from Valfrido and Angelina. There's time for a dip in the pool (typically open June - early September) before dinner. You could laze by the pool but it's a shame to miss out on Vicenza! A cycle path (those feeling lazy can catch the bus) takes you there past the famous Palladian villa, La Rotonda. nicknamed 'Venice of the Terra Firma' for its marvellous architecture, Palladio designed dozens of the city's buildings, from the Basilica Palladiana in the main square to the Teatro Olimpico. There's plenty to explore. Today's route follows the Strada del Tocai Rosso (the only area outside of Hungary where the red Tocai is grown). The wine road links a string of pretty villages, each with their own Venetian campanile. Then it's out across the plain to reach Vo Vecchio, criss-crossed with canals. The Euganean hills are spread out in front of you as you cycle through the vineyards to Gabriella and Alessandro's farmhouse for your last dinner. 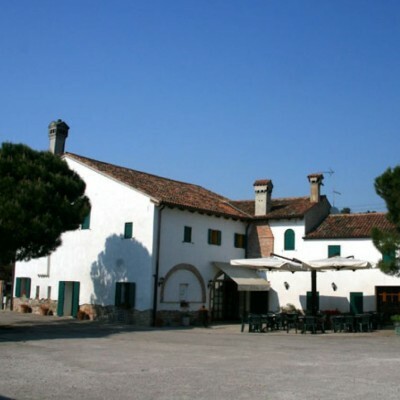 This lovely agriturismo is a charming, tranquil place in the middle of vineyards. Run by Gabriella and Alessandro - it's been in their family for over 200 years! - the family make their own olive oil and honey as well as their own wine. Your evening meal is Gabriella's home-made regional fayre. The agriturismo offers 6 rooms, which are simple but comfortable, with polished pine floorboards, brightly coloured counterpanes and ensuite bathrooms. The dining room also has quite a rustic but homely feel to it, with stone walls, exposed wooden beams and brightly coloured table cloths. 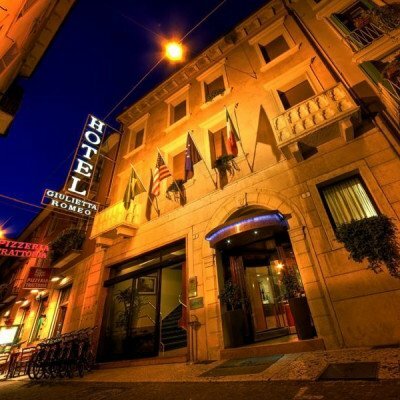 The Hotel Belvedere is situated in the outskirts of Galzignano,on the edge of the vines on the way to the nearby wine village of Torreglia. You'll feel immediately at home here - especially given the warm welcome you receive from the hospitable Ottolitri family. The hotel is cosy throughout, from the welcoming lounge area where you can relax before or after dinner with its pastel coloured, cosy armchairs and open fire, to the bedrooms, all decorated in their own floral pattern. Room upgrades: Comfort room with private garden. Villa Lussana is a beautifully restored Liberty villa, with an attractive peach and white facade. The hotel is run by Tiziana and Alessio. Being slightly above the main square, the Villa's large terrace enjoys glorious views over the picturesque collection of houses of Teolo and the surrounding, imposing Euganean Hills. The rooms are elegantly furnished to match the Liberty decor, which has been maintained throughout. 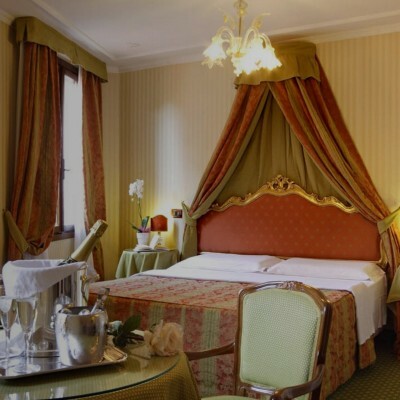 They have all the modern comforts too, which are cunningly concealed behind the grandiose decor. Room upgrades: Superior room with balcony	. Transfers included from Vicenza train station at 14:03 and back to Vicenza train station at 12:45. Cycling from Slovenia was a great experience. Dependent on flight times though, I would suggest just one night in Ljubljana and an extra night in Bled. I agree with other reviewers, that it would have been good to spend more time in Slovenia. The local agent was very helpful and gave us a full briefing using his computer which was very helpful. This was the best briefing we have had from a Headwater 'agent'. The Veneto cycling was not as spectacular as our previous week. We enjoyed it though. A good opportunity to see a different less touristy part of Italy. We particularly enjoyed staying in the agriturismo which are friendly and welcoming. The only thing that really concerned us was the use by the taxi driver of his mobile phone (reading texts, not calling) at 80 mph on the motorway returning to the airport. I suggest Sarah should have a word with him. I am sure there is a Headwater policy on this. Apart from this, we had a good time, Sarah was a good rep and her notes were excellent. The Veneto is a good area for people like us (60 plus) and we found the local services offered good value for money, better than we expected for Italy. Il Feudo is rather a disappointing place to start and finish the holiday; it was below the par of the other places in terms of food and accommodation.........and ice is a problem there. Thank you for taking the time to complete your post-holiday questionnaire. We do review all of the feedback we receive and use this to help us improve and develop our holidays for the future. With this in mind, we were sorry to read of your concerns regarding your return transfer. Please be assured our customer�s safety and well-being is a top priority and we expect the same priority from our local suppliers, therefore, the type of behaviour you have highlighted is completely unacceptable; please be assured we will discontinue using this supplier with immediate effect. Please accept our sincere apology for the upset or anxiety this may have caused. We were also disappointed to read of your dissatisfaction with the Il Feudo, ordinarily, this hotel scores well and receives positive feedback. However, please be assured, we do realise the importance of maintaining our high standards of accommodation and service and appreciate we cannot afford to let these standards slip. We will continue to work with our Hotelier to ensure they are delivering the kind of accommodation and meals our customers expect. Despite these issues, we were pleased to read you enjoyed your holiday overall and rated the service provided by Sarah and the routes notes we provide as a valued addition to your holiday. In closing, we would like to thank you for your constructive feedback. We look forward to welcoming you on another of our holidays in the future. Every two days from 25th Apr 2019 to 12th Oct 2019, for 8 nights. All dates are subject to availability, please contact us to check. Due to the tailor-made nature of our holidays, we need a little more information in order for us to check availability for Venetian Villas and Vineyards Cycling. Simply complete the form below and a member of our sales team will contact you (when it's most convenient for you) to provide availability information, travel options and an accurate price. Of course there's no obligation, but if you do wish to proceed with a booking they will be on-hand to assist you throughout the process. When should we contact you ASAP --- Today 5pm - 7:30pm ---Tomorrow 9am - 1pm Tomorrow 1pm - 5pm Tomorrow 5pm - 7:30pm ---Wednesday 9am - 1pm Wednesday 1pm - 5pm Wednesday 5pm - 7:30pm ---Thursday 9.30am - 1pm Thursday 1pm - 5pm Thursday 5pm - 7:30pm ---Friday 9am - 1pm Friday 1pm - 5pm Friday 5pm - 6:30pm ---Saturday 9am - 1pm Saturday 1pm - 3:30pm ---Please reply by email We can call you when it's most convenient for you, or contact you by email if you'd prefer. During busy periods we cannot always guarantee a specific call time but we promise to try our very best.